SoftwareCEO FinalistOakbrook Terrace, Ill. (PRWEB) April 18, 2008 — The Computing Technology Industry Association (CompTIA), the leading trade association for the world’s information technology (IT) industry, announced today the finalists for the second annual CompTIA SoftwareCEO Software Innovation Awards. 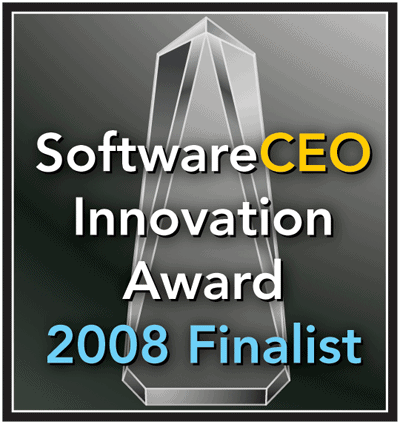 The SoftwareCEO Software Innovation Awards recognize innovative software products and new business models in eight different categories. Award winners will be announced at the CompTIA Software Marketing Perspectives Conference & Expo May 7-9, 2008 at the Santa Clara (Calif.) Convention Center. Company Achievement in Innovation (five finalists) – Maximizer Software MaxMobile, Nexidia, Next IT Corporation ActiveAgent™, Print Audit, and Visible World IntelliSpot™. Most Innovative Enterprise Software (nine finalists)- Bit9 Parity, ICT Inc. AcceleNet, Intermine FileCensus, JackBe’s Presto Enterprise Mashup Platform, Knoa Experience & Performance Manager (EPM), Next IT Corporation ActiveAgent™, Q.Know Technologies Enterprise Software, SAVO, and Splunk 3.1.5. Most Innovative General Business Software (seven finalists) – BoardVantage Board Portal Secure Vault, Boston College Center for Corporate Citizenship Assessment Tool, Central Desktop, Integration Point, Market2Lead, Rapid Intake Unison, and SmartDraw 2008. Most Innovative Small and Medium-Sized Infrastructure Software (four finalists) – BlueCat Networks Proteus, eEmpACT Software Version 14.0, HyperOffice, and InnoSource Docufree. Most Innovative Service/Business Model (eight finalists) – Generate gClick, SAVO, Skoach, SPS Commerce, Tax Technology Services CertCapture, TriActive Systems Management On Demand™, Unisfair Virtual Events, and Vitrium Systems docmetrics. Most Innovative Software for the Software Industry (five finalists) – Accept Software Innovation Management Solutions, Aladdin HASP SRM, Bomgar Version 10.0, OpSource Connect, and SourceKibitzer EyeQ. Most Innovative Software Idea (two finalists) – Green Print and Next IT Corporation for ActiveAgent™. Most Innovative Vertical Industry Software (seven finalists) – Autotask, Bullhorn On Demand Integrated Front Office Software, Exaktime PocketClock/GPS, Gemcom InSite, Greycon Ltd. D-Opt, Scivantage Maxit, and Satori Group i-Performance. Scope – What business problem or opportunity does the software innovation address? What is the size of the problem/opportunity? Impact – What practical results, such as sales, users or profits, has the innovation had on a software product or on the software industry? The innovation must be new and have both a current and future impact. Novel – How does the innovation break with traditional ideas or processes? SoftwareCEO is a resource-packed electronic newsletter and web portal built by software executives for software executives. It’s the software industry’s ‘Page One’ for information and advice on software marketing, software sales, software business, software pricing and financing, and software services. For more information, visit http://www.softwareceo.com.